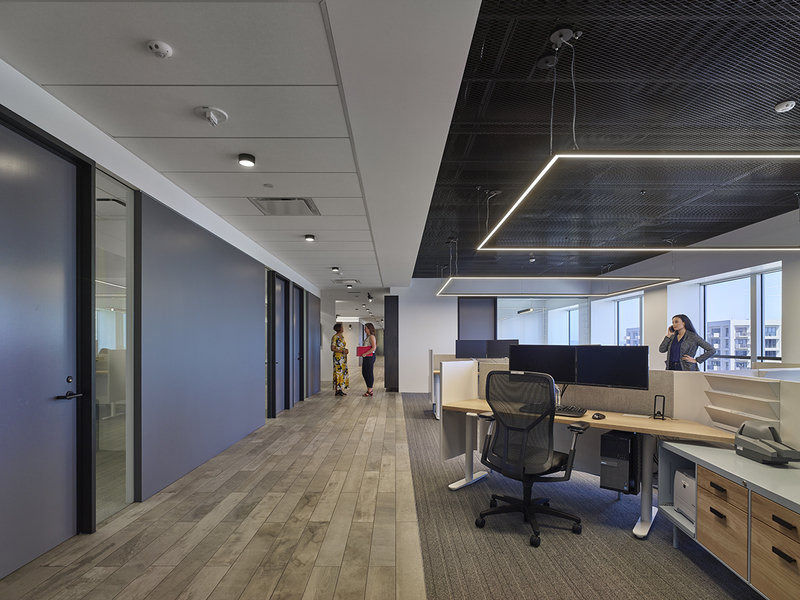 A commercial interior project for the client, Savitsky Satin Bacon & Bucci (SSBB), a privately-held financial advisement company with a proud history serving sports and media celebrities. 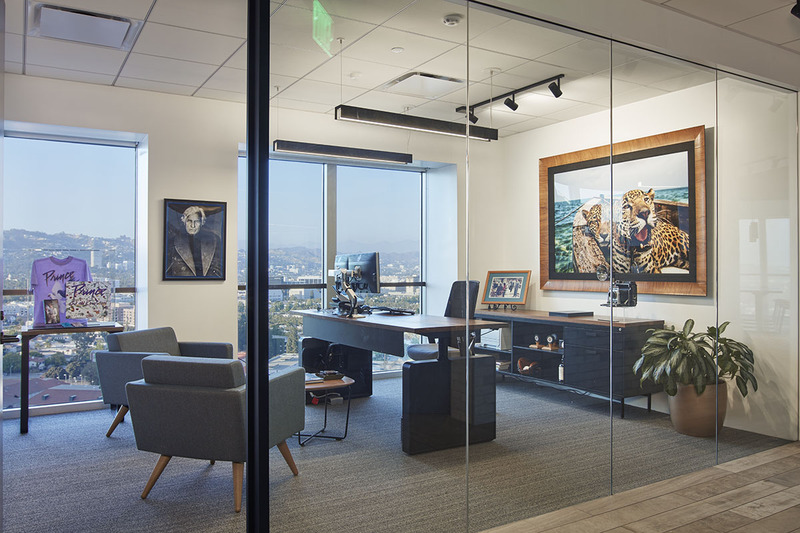 In their need to expand operations, the opportunity arose to move into the iconic Twin Towers in Century City, which is where SSBB had initially opened its first office. 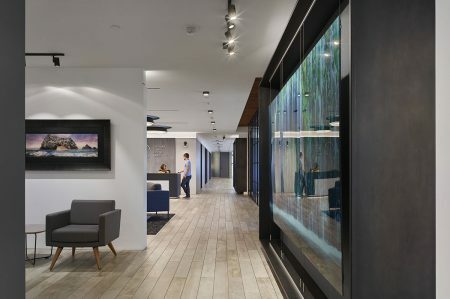 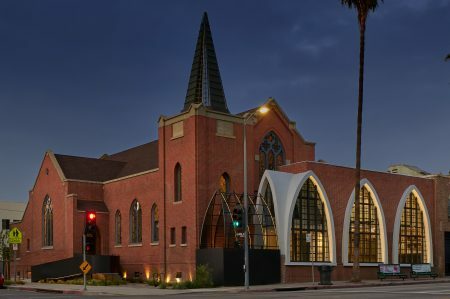 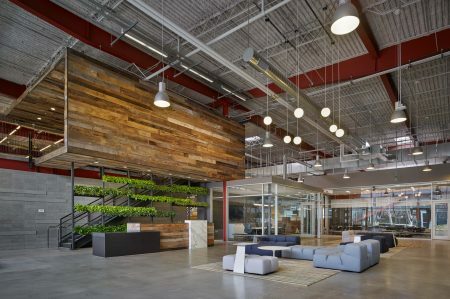 The new office focuses on their company’s origins while capturing future growth and modern technologies to capture this unique history and commitment to their clients. 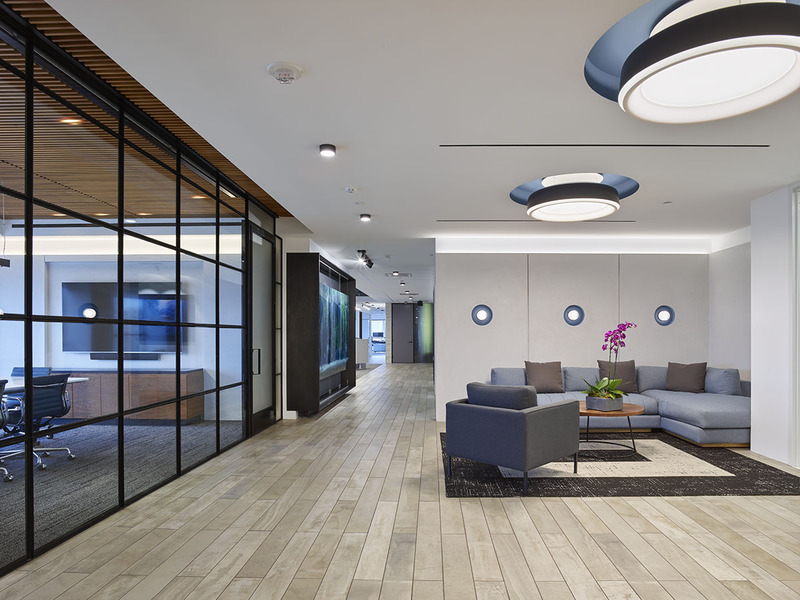 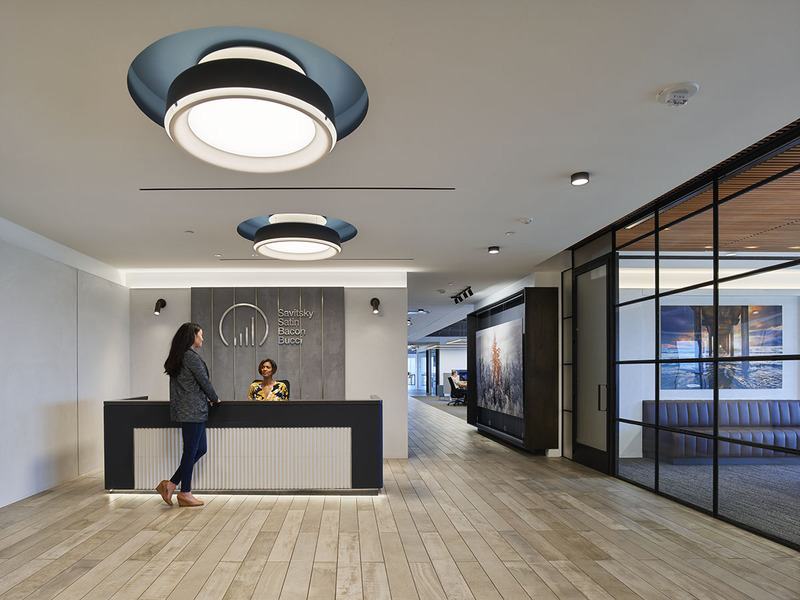 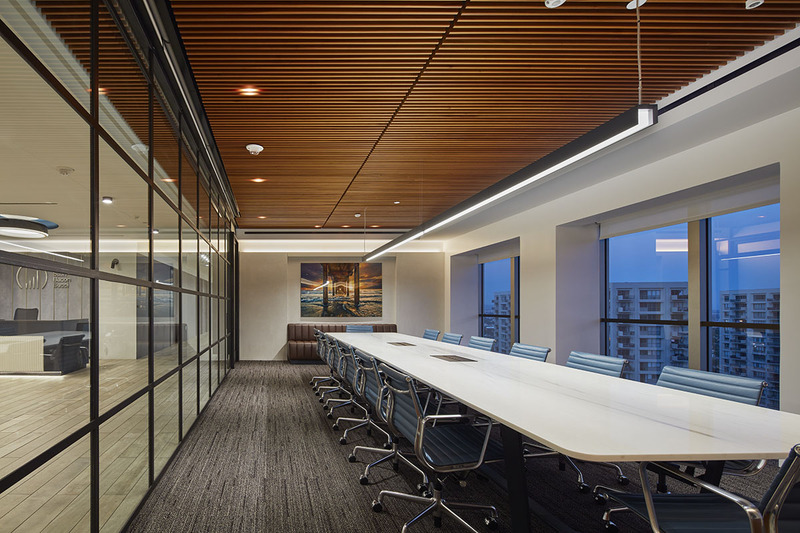 The entrance lighting sets the tone for the office space, with custom fabricated “portal” light fixtures set into the ceiling with a cool-blue soffit light to accentuate the feature. 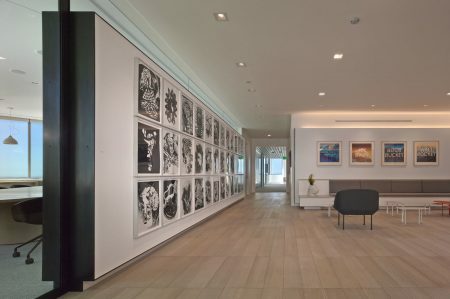 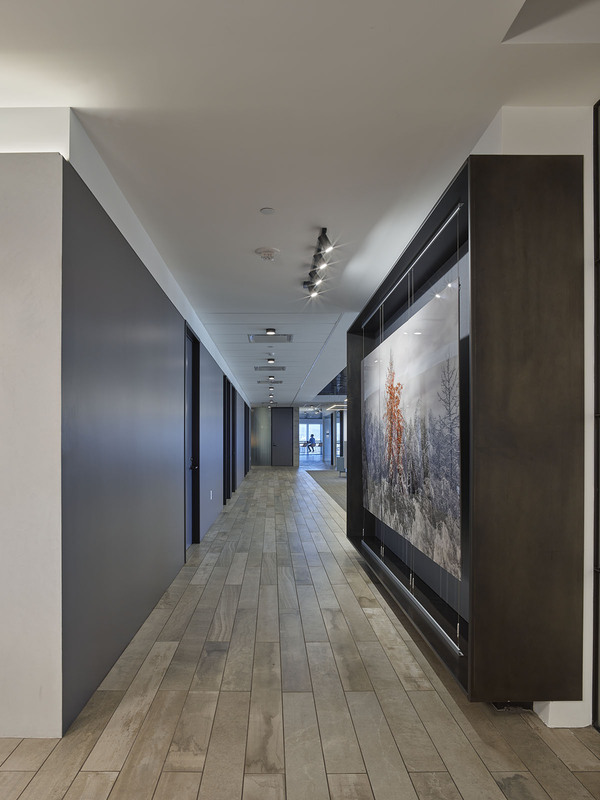 Smaller forms of these lights are carried onto the entry wall set into the plaster and similar lighting elements throughout the office. 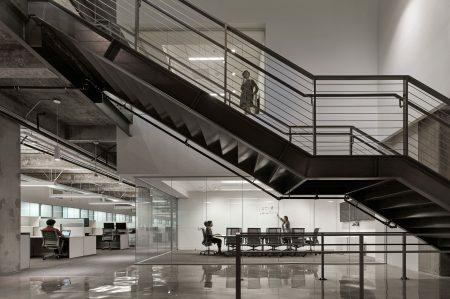 The unique triangular geometry of the floor plates allows for creative usage of the space, employing different materials and elements to denote the circulation and office functions. 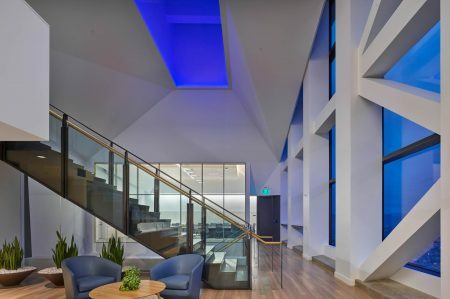 The entrance is located in the middle of the triangular edge and extends both directions to the vertexes at either end. 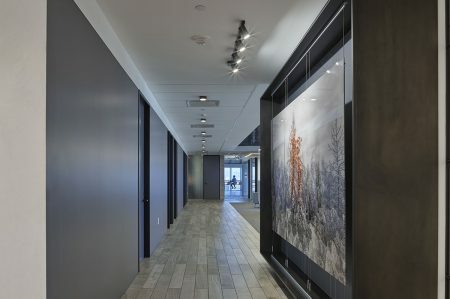 The entrance/reception is treated to emulate a stone/concrete finish with white plaster and extends into the circulation core with the drop-ceiling customized to have a more modern and luxurious feel. 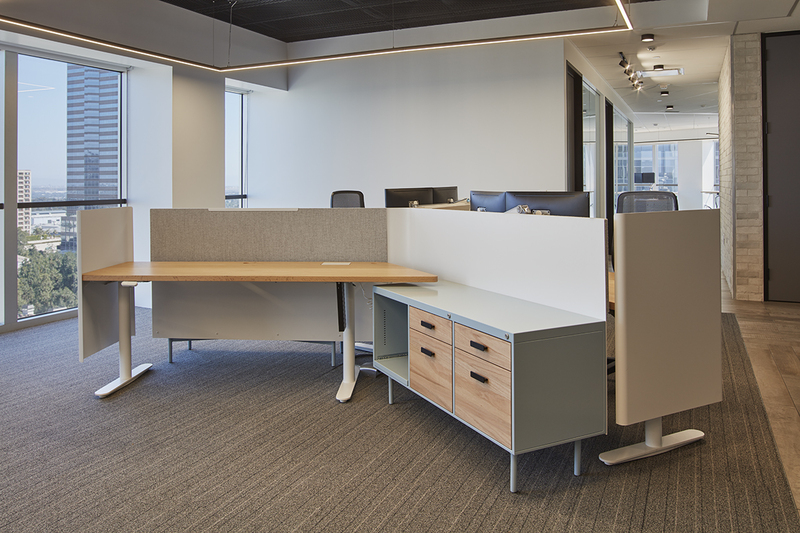 Open workstations fill the spaces between individual offices, facing the outward windows. 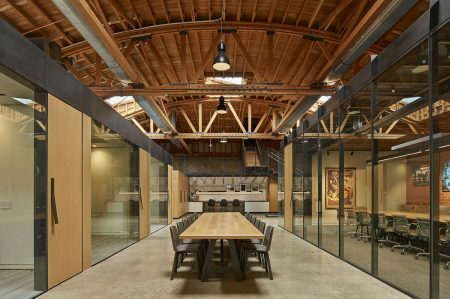 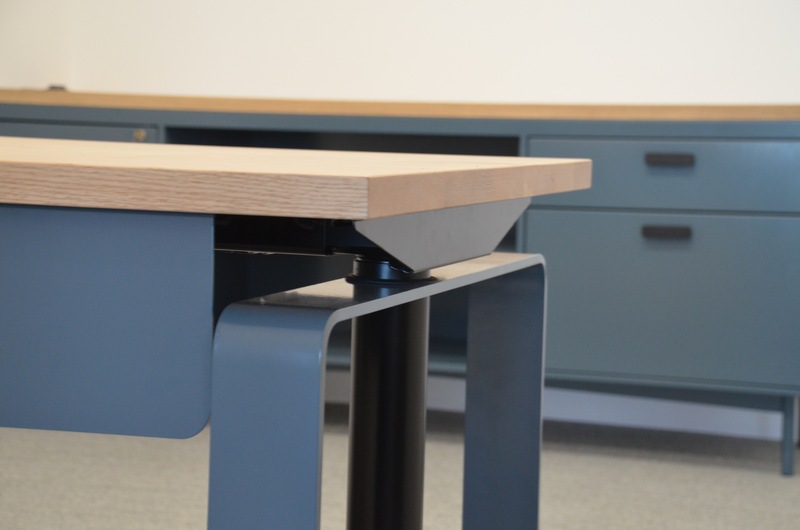 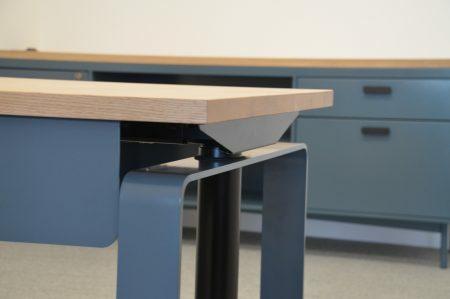 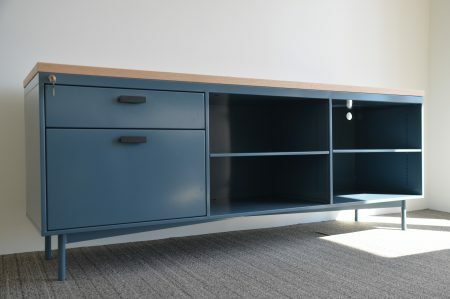 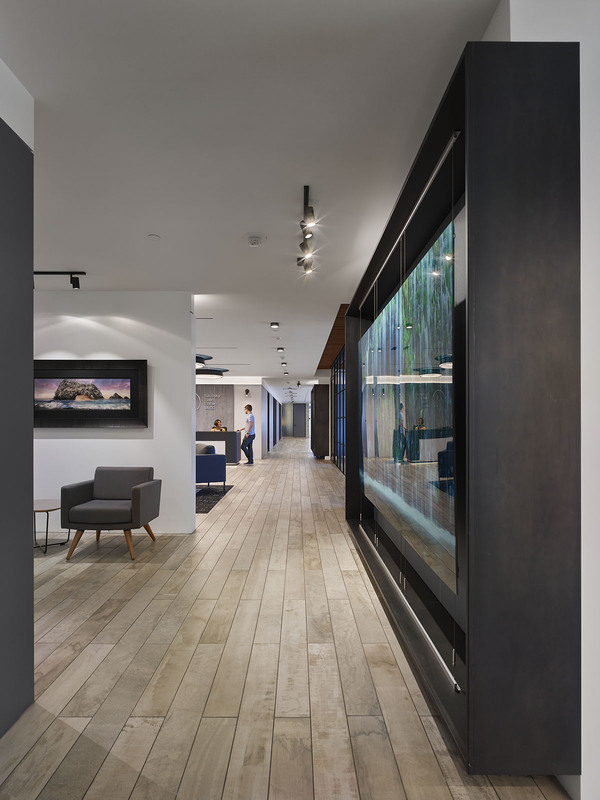 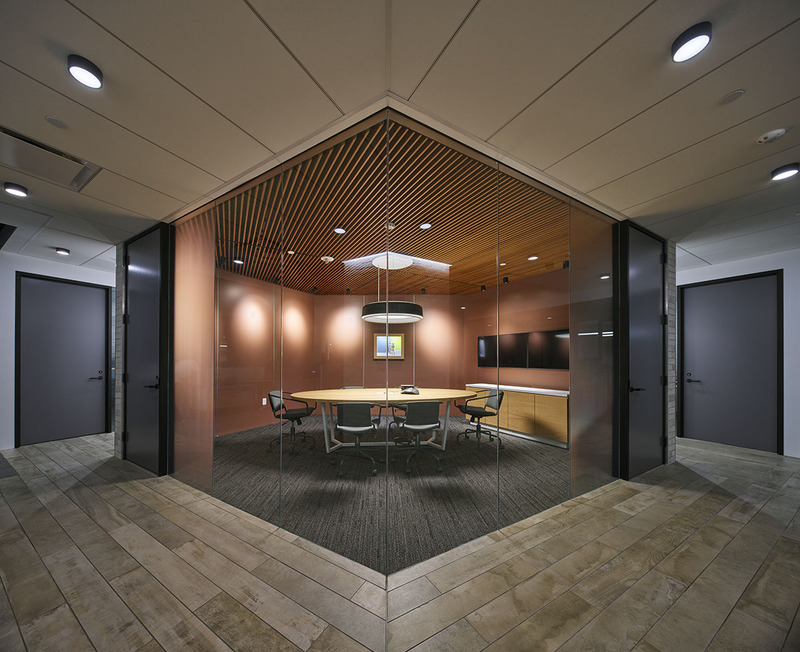 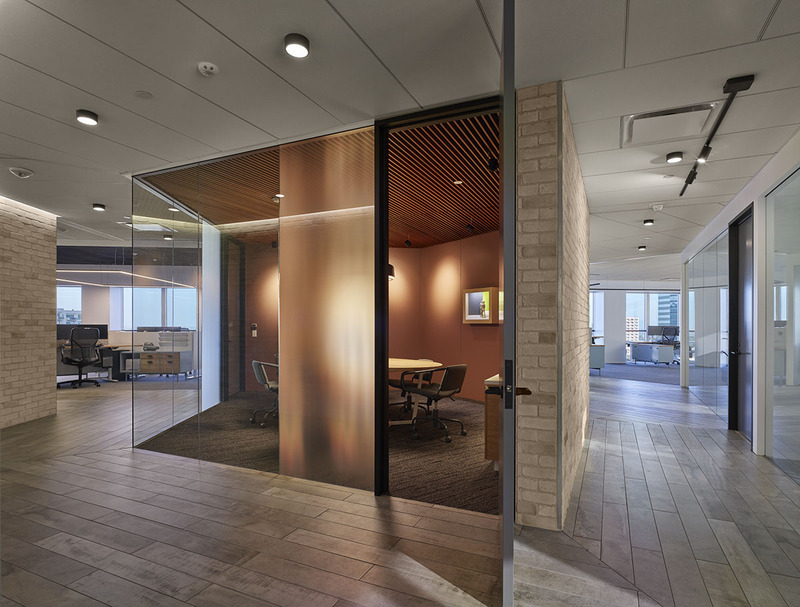 The workstations were custom-designed in partnership with MASH Studios and utilize the space to its fullest potential by emulating the triangular floor-plate. These workstations are oriented to allow both privacy, due to the nature of the work tasks, and collaboration between the staff. 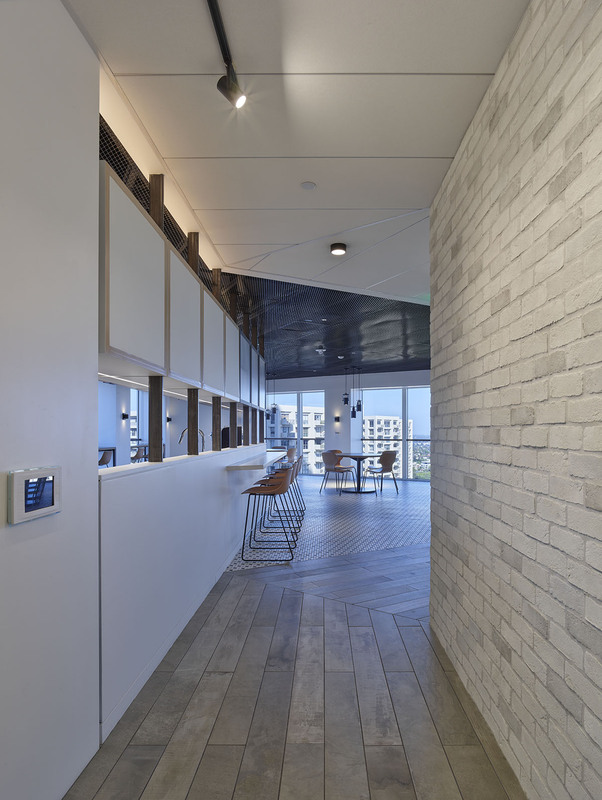 The kitchen is proudly located at a vertex of the triangle and allows stunning views of Beverley Hills, DTLA, and the Santa Monica Bay. 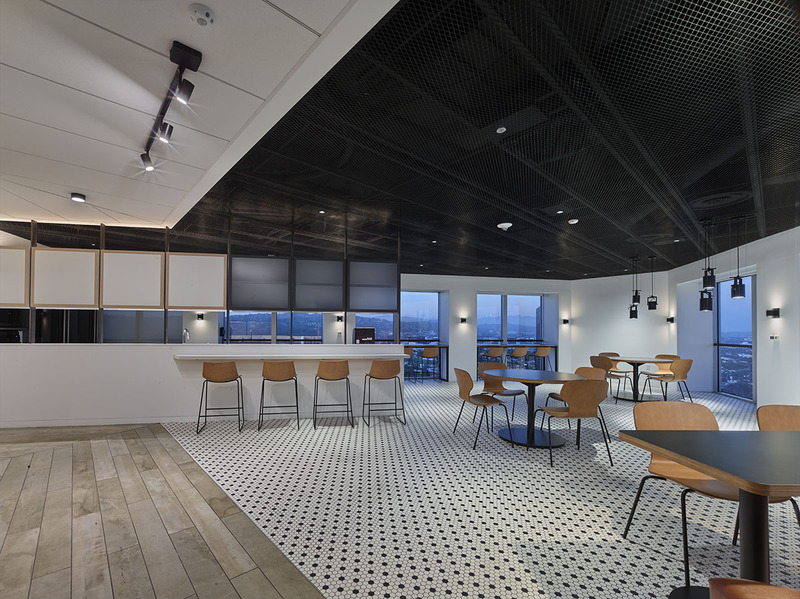 This corner is the most open of the spaces within the office, with ample space for staff-members to congregate and a café-feel.